Make a rubber chicken bone: Soak bones in vinegar to simulate the decalcification of bones that can result from osteoporosis. 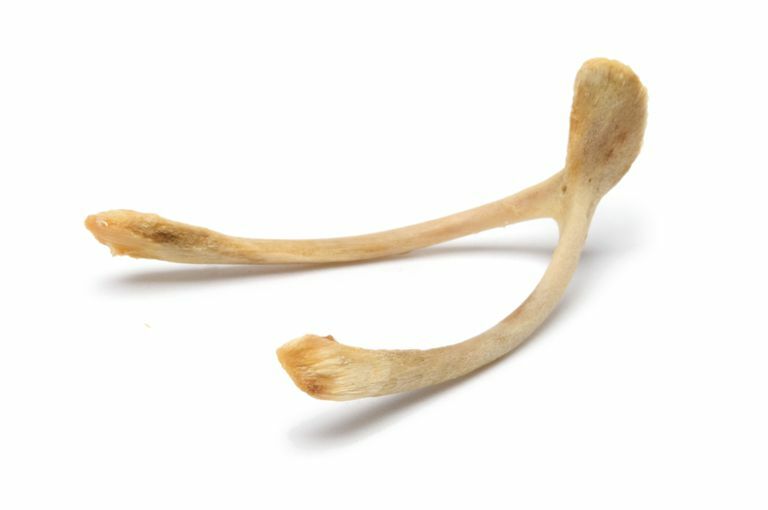 You won't be able to make a wish on a wishbone with the rubber chicken bone science experiment! In this experiment, you use vinegar to remove the calcium in chicken bones to make them rubbery. This is a simple project that illustrates what would happen to your own bones if the calcium in them is used more quickly than it is replaced. While you can use any bone for this experiment, a leg (drumstick) is a particularly good choice because it's normally a strong and brittle bone. Any bone will work, though, and you can compare bones from different parts of a chicken to see how flexible they are initially compared with how they change when calcium is removed from them. Try to bend a chicken bone without breaking it. Get a sense of how strong the bone is. Soak chicken bones in vinegar. Check on the bones after a few hours and days to see how easy they are to bend. If you want to extract as much calcium as possible, soak the bones in vinegar for 3-5 days. When you are done soaking the bones, you can remove them from the vinegar, rinse them in water and allow them to dry. While you have vinegar handy, how about using it to make a bouncy ball from an egg? The acetic acid in the vinegar reacts with the calcium in the chicken bones. This weakens them, causing them to become soft and rubbery as if they had come from a rubber chicken. The calcium in your bones is what makes them hard and strong. As you age, you may deplete the calcium faster than you replace it. If too much calcium is lost from your bones, they may become brittle and susceptible to breaking. Exercise and a diet that includes calcium-rich foods can help prevent this from happening. While the calcium in bones in the form of hydroxyapatite makes them strong enough to support your body, they can't be made completely of the mineral or they would be brittle and prone to breakage. This is why vinegar doesn't completely dissolve bones. While the calcium is removed, the fibrous protein called collagen remains. Collagen gives bones enough flexibility to withstand everyday wear and tear. It is the most abundant protein in the human body, found not just in bones, but also in skin, muscles, blood vessels, ligaments, and tendons. Bones are close to 70% hydroxyapatite, with most of the remaining 30% consisting of collagen. The two materials together are stronger than either one alone, in much the same way reinforced concrete is stronger than either of it components. Carbonated soft drinks are also acidic. What happens if you soak bones in soda rather than vinegar? Teeth consist almost entirely of the calcium mineral hydroxyapatite. What do you predict will remain of a tooth if you soak it in vinegar for a long time? How about the effect of soda on teeth?